Rabbi Dr. Eliezer Ehrenpreis, known to mathematicians as "the kindly superman" for his remarkably diverse accomplishments, passes away at 80. Rabbi Dr. Eliezer (Leon) Ehrenpreis, known to mathematicians as "the kindly superman" for his remarkably diverse accomplishments –– mathematical researcher of international renown, eminent Torah scholar, and runner who completed every New York City Marathon from its inauguration in 1970 until 2007 -- died of heart failure on Monday in New York City. He was eighty years old. Rabbi Eliezer Ehrenpreis was an eminent scholar of Talmudic texts who received rabbinical ordination from the greatest decisor of Jewish law in the post-Holocaust period, Rabbi Moshe Feinstein. Viewed in religious circles as a "bridge between two worlds," Rabbi Ehrenpreis remained an advisor on mathematical and scientific issues to Rabbi Feinstein until the famed authority on Jewish law passed away in 1986. Prof. Ehrenpreis, together with Bernard Malgrange of France, proved the Malgrange-Ehrenpreis theorem, a foundation-stone of the modern theory of differential equations. Until his death, Dr. Ehrenpreis was a professor at Temple University, Philadelphia, which held an international mathematics research conference in his honor in 1998. Before joining its faculty in 1984, he served as professor at NYU's Courant Institute of Mathematical Sciences and at Yeshiva University's Belfer Graduate School of Science. He also held positions at Brandeis University, the Institute for Advanced Study in Princeton, Princeton University, Yale University, and Harvard University, and at the Hebrew University in Jerusalem, the University of Paris, and Kyoto University, Japan. He supervised twelve doctoral students, eight at NYU and four at Temple University. Prof. Ehrenpreis taught at Hebrew University and Bar-Ilan University on his frequent visits to Israel. Dr. Ehrenpreis grew up on the Lower East Side of Manhattan, in the Brighton Beach neighborhood of Brooklyn, and in the Bronx. After graduating with honors from Stuyvesant High School, he obtained his B.A. at City College in a class that included, among his "pals," many future celebrated scientists, including Nobel Prize winner Robert Aumann. Prof. Ehrenpreis then earned his Ph.D. in 1953 from Columbia University at the age of twenty three. He served in the National Guard during the Korean War. Through his career, Dr. Ehrenpreis published prolifically and was the author of several volumes of mathematical research, including Fourier Analysis in Several Complex Variables (1970) and The Universality of the Radon Transform (2003). Dr. Ehrenpreis was well-known in the mathematical community for combining punctiliousness in performance of Jewish religious observances with characteristic impatience for bureaucratic rules, about which mathematicians would swap "Leon stories." Since his first 26-mile run in 1970, Dr. Ehrenpreis never missed completing the New York City Marathon, despite having to perform a wedding chuppah immediately on completion and his baby’s due date another year. He ran it for 37 years, until the age of seventy-seven. During the height of the Intifada he showed his love of Israel by running the 26 miles through New York City in an IDF T-shirt and hat. INN covered his marathon run at the age of 76, four years ago. 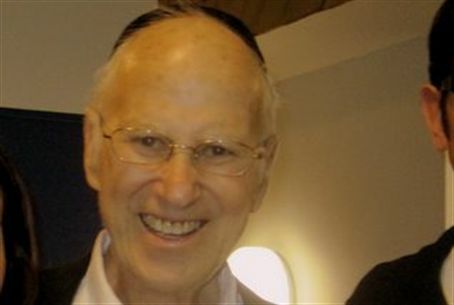 Dr. Ehrenpreis is survived by his wife, Ahava (née Sperka), originally of Detroit, his eight children (including a daughter in Neve Daniel), his thirteen grandchildren, and a brother, Dr. Seymour Ehrenpreis of Chicago, Illinois. His son-in-law, Daniel 'Mush' Meyer, is public relations director of the Young Israel Movement in Israel.